We’ve hooked up with the super talent that is, Chris Brumcast to bring you a taster of forthcoming Capsule shows. It’s a real treat and hopefully will get you all excited about our amazing program of shows, kicking off with Brooklyn based mavericks KAYO DOT on Wednesday 16th Feb at the Hare & Hounds. 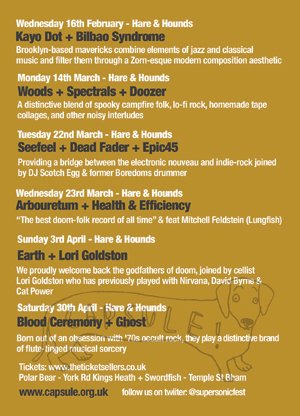 Followed shortly by a combo of lo-fi rock and spook campfire folk in the form of WOODS, with support from SPECTRALS + DOOZER on the 14th March. A real delight on the 22nd with SEEFEEL feat. by Shigeru Ishihara (DJ Scotch Egg) and former Boredoms drummer Iida Kazuhisa (E-Da) with support from DEAD FADER + EPIC 45 (be warned tickets are flying out for this show). The very next day on the 23rd we have a Supersonic favourite ARBOURETUM for fans of Earth and Lungfish, not to be missed with support from multi-instrumentalists HEALTH & EFFICIENCY. In April we welcome back the godfather of drone EARTH with support from LORI GOLDSTON who has played with Nirvana, David Byrne & Cat Power to name but a few. On Saturday 30th April BLOOD CEREMONY who play a distinctive brand of flute-tinged musical sorcery with support from Swedish prog band GHOST will be playing at the Hare & Hounds. We look forward to seeing you at one or all of the above shows, and a huge thanks to Chris for putting this fantastic podcast together for us, a perfect soundtrack for a day in the office!